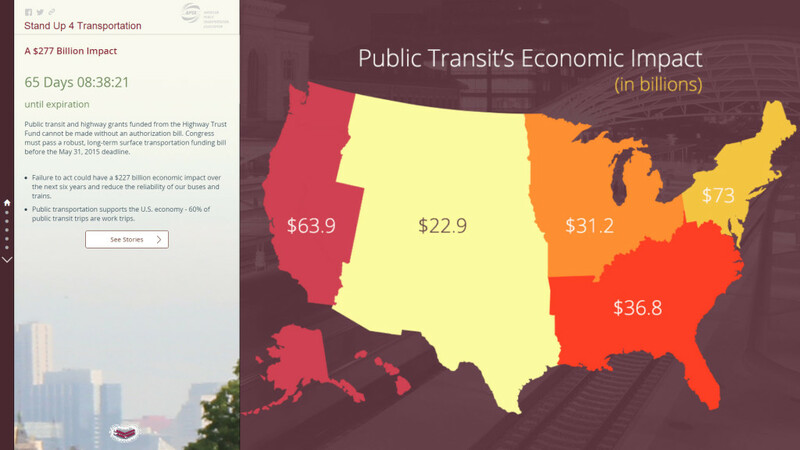 The American Public Transportation Association (APTA) asked Blue Raster to create a story map to spread their message. According to APTA, public transit saw its highest ridership in 58 years at 10.8 billion trips, but the current federal funding bill is set to expire on May 31, 2015. Although a long-term transportation bill is supported by the transportation industry in near unanimity, APTA wanted a way to connect their message with constituents and to broadcast it out to a wide audience. The Stand Up 4 Transportation story map features first-person narratives describing how public transit is impacting people in all parts of the country and sectors of the economy. The story map strategically launched in coordination with national Stand Up For Transportation Day on April 9th, a keystone event for showing national bill support. The ability to share the map on social media enabled APTA to amplify their message. Launching the application helped propel #SU4T on Twitter, Facebook, and other social media. By using maps, APTA was able to show the scale and impact of public transit, in a new way that text could not. View the Stand Up 4 Transportation story map and see for yourself how your story can get in front of Congress and decision makers.